After losing to Alexander Volkanovski by second-round TKO on the UFC 232 main card, long-time featherweight contender Chad Mendes has announced his retirement from MMA. Farah Hannoun confirmed this news on Twitter. Chad Mendes had his moments in his fight with Alexander Volkanovski, even dropping the Australian at one point, but ultimately began to fade in second frame, at which point Volkanovski cranked up the offense for the finish. Both fighters earned $50,000 Fight of the Night bonuses for their entertaining, back-and-forth scrap. Other than Volkanovski, Mendes has only lost to irrefutable legends of the sport in former featherweight champions Jose Aldo (twice) and Conor McGregor, and former lightweight champion Frankie Edgar. The Team Alpha Male staple, who challenged for the UFC featherweight title twice, and for the interim featherweight title once, holds wins over fighters like Steven Siler, Erik Koch, Cub Swanson, Michihiro Omigawa, Rani Yahya, Cody McKenzie, Darren Elkins, Clay Guida, Nik Lentz, Ricardo Lamas, and Myles Jury. He hangs up the gloves with a 18-5 overall record. 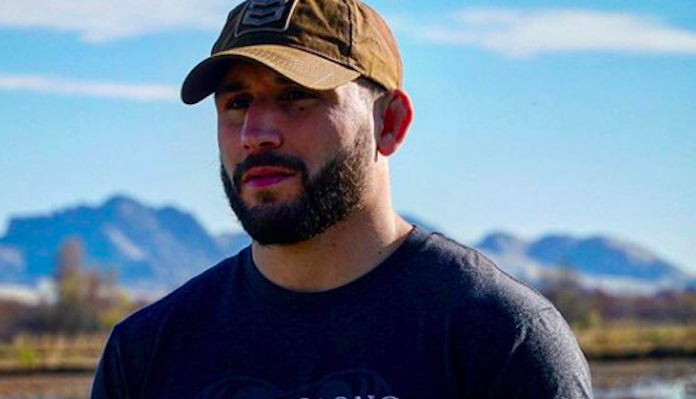 While Chad Mendes is apparently done fighting, he’s got plenty of other business on the go, most notably as the owner of Finz & Featherz, a hunting and fishing guide service. All the best to Chad Mendes in life after fighting!